Convert the point from Cartesian coordinates into polar coordinates. Convert the complex number into trigonometric form. For both problems, a point is identified that is 5 steps to the right of the origin and then 5 steps below the axis (or real axis). To make this more kinesthetic, I’ll actually walk 5 paces in front of the classroom, turn right face, and then walk 5 more paces to end up at the point. $5-5i$ can be rewritten as in trigonometric form. Once this is obtained, I’ll walk it out: I’ll start at the origin, turn clockwise by 45 degrees, and then take steps to end up at the same point as before. Continuing the lesson, I’ll ask if the numbers and , or if some other angle and/or distance could have been chosen. Someone will usually suggest a different angle, like or . I’ll demonstrate these by turning 315 degrees counterclockwise and walking 7 steps and then turning 675 degrees and walking 7 steps (getting myself somewhat dizzy in the process). For more information, please see my series on complex numbers. This student submission comes from my former student Perla Perez. Her topic, from Precalculus: graphing with polar coordinates. Graphing polar coordinates is usually taught in a Pre-Calculus class. Students have learned about the Cartesian Coordinates and extend their knowledge to polar coordinates. Unlike Cartesian Coordinates, which represent how to get from a specific point to the point of origin (or vice versa), the polar coordinate tells us the direction by the angle, and the distance from that point to the origin. Students will need to know how to take the measure of an angle and how to use the Pythagorean Theorem to solve for the distance which is considered the radius. Most students who are enrolled in a Pre-Calculus class have taken geometry where they have learned about the Pythagorean Theorem and what a radius is. This alongside their algebra 1 and geometry classes means they also know how to graph and plot points. Polar coordinates use a different type of graph, rather than just an x and y coordinates plane. The polar coordinate plane includes symmetrical circles surrounding the center and is given a radius creating a graph that looks like a dart board. At this point students should know what a polar coordinate is. The next step is actually graphing it. 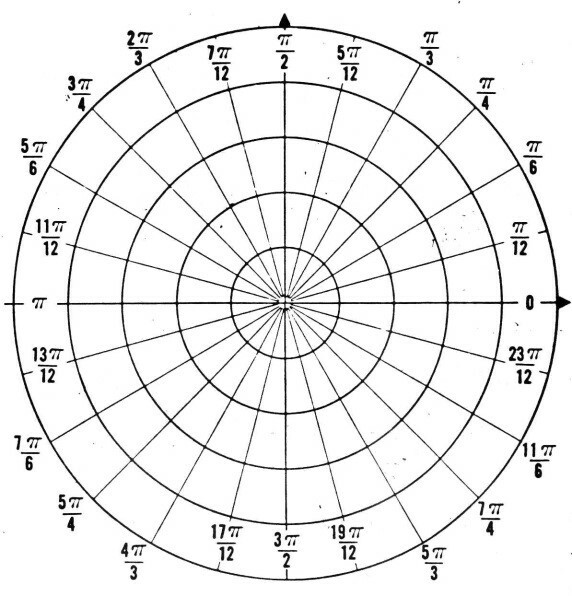 As an activity to get students excited for the wonderful world of polar coordinates, I have created a dart board game. Using an appropriate dart board, such as a magnetic one, have the students create groups of three to four student each. The point of the game is to have students create polar coordinates. The board must be properly labeled with the angles. There will be four rounds, depending on the number of members in a group. When a member throws a dart at the board it must land on a point. Wherever it lands the students must figure out the radius and the angle of the dart to the origin. This game enables students to practice finding the radius and the angle of the dart with only their previous knowledge, labels, and each other. Throughout centuries and in all parts of the world, mathematicians and astronomers have come to shape our understanding of the polar coordinate system. Two Greek astronomers Hipparchus and Archimedes used polar coordinates in much of their work. Though they didn’t commit to the full coordinate plane, Hipparchus first begins by writing a table of chords where he was able to define stellar positions. Archimedes focused on a lot on spirals and developed what now known as the Archimedes spiral, in which the radius depends on the angle. Descartes also used a simpler concept of coordinates, but relating more to the x-axis. In 1671, Sir Isaac Newton was one of the biggest contributors to the elements used in analytic geometry. The idea of polar coordinates, however, comes from a man named Gregorio Fontana (1735-1803), centuries later. Astronomers now use his polar coordinates to measure the distance of the sky and stars. Using the fact that is independent of , I’ll now give a fourth method. So far, I’ve handled the cases and . In today’s post, I’ll start considering the case . I’ll continue with this fourth evaluation of the integral, continuing the case , in tomorrow’s post. This student submission comes from my former student Laura Lozano. Her topic, from Precalculus: graphing with polar coordinates. An activity that I believe will go really well with graphing polar coordinates or any type of graphing lesson will be to convert the classroom floor into a graph. Also, I will have a selection of random objects like, a rubber ducky, boat, toy, etc. The size of the graph will depend on the size of classroom of course. If the classroom is really small then I would have to take this activity outdoors or maybe even the gym or anywhere with enough room for the graph and my students. The graph doesn’t have to be super big but I would use a graph no smaller than 8 feet by 8 feet area. I could create the graph lines with tape on the floor or draw them on big paper and tape the paper on the floor. I would start the activity with first talking about points on a Cartesian graph. An example could be to first have a students plot a couple points like (5, 4), (3, 6), or (-4, 2) on the board. Then transition them from Cartesian to polar coordinates by using the floor graph and have them discover how they relate by using the x and y coordinates to find the radius and the angle. Then later, after they get the hang of it, I would have the class split up into groups of two and let them choose an object, like a rubber ducky, boat, or toy, to set on the graph and have them write and tell me the point of their object. We see radars in the news almost all the time. One category that it is usually used in is weather. The weather center uses their radars to detect for any water particles, debris, and basically anything that is in the air that could be approaching. The way that they tell if a storm or any other weather change is coming is by the radar’s omitting radio waves. The radar omits waves that then come back to the radar if the waves clash with anything in the air. The radar can detect how far an object is by the time it takes for the wave to come back. It works just like an echo! Also, recently with the search of the Malaysian airplane, we saw it used more. The news will show a clip of aircraft radar or ship radar searching for something in the air or in the ocean. Radars look almost exactly like a polar graph does. On the left is a regular polar graph. 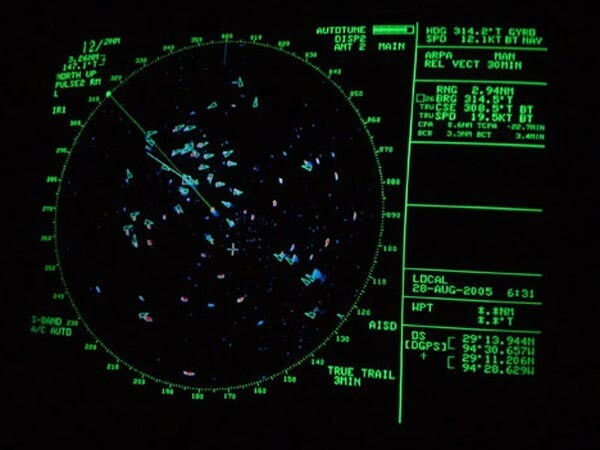 On the right is a ship’s radar. Both graphs have angles with circles. Graphing calculators can be used to discover polar coordinates and polar equations. I would first tell them to take out their calculators and just type in a random number from -10 to 10. I choose this interval because the graphing calculators have this window preset for graphing. I number that I randomly chose was the number 4. So I would go to the “Y=” button and type in 4. Then I would hit “GRAPH” and I should get a straight line horizontal line going through the y-axis at 4. I would then change the calculator mode and change from “FUNC” to “POL”. Then I would tell them to do the exact thing again with whatever number they chose. Once the hit “GRAPH” a circle should then come up. They then see how different polar graphs are from Cartesian graphs. 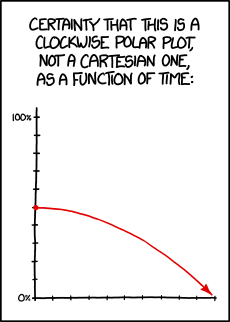 Now, the graphs on a polar coordinate graph will all be circular instead of lines and curved lines like on the Cartesian graph. and we don’t have to worry about “other” solutions. where and , with in the appropriate quadrant. This is analogous to converting from rectangular coordinates to polar coordinates. Over the past few posts, we developed the following theorem for computing in the case that is a complex number. In the remaining posts in this series, I want to explore which properties of exponential functions remain true when complex numbers are used. However, in previous posts, we’ve seen that the rules and may not be true if nonpositive bases, let alone complex bases, are used. Dividing, we see that . At long last, we are now in position to explain the last surprising results from the calculator video below. Naturally, this definition makes sense if and are real numbers. which is (surprisingly) a real number. In other words, a problem like this is a Precalculus teacher’s dream come true, as it contains , and in a single problem.